Back at the beginning of 2000, I was on a cruise and picked up a delightful novel. It was When I Fall in Love by Iris Rainer Dart (the author of Beaches). It was so good that I read it in two days. I even found myself tearing up at times. It was just a romantic story about a comedy writer and the unlikely way she finds love. 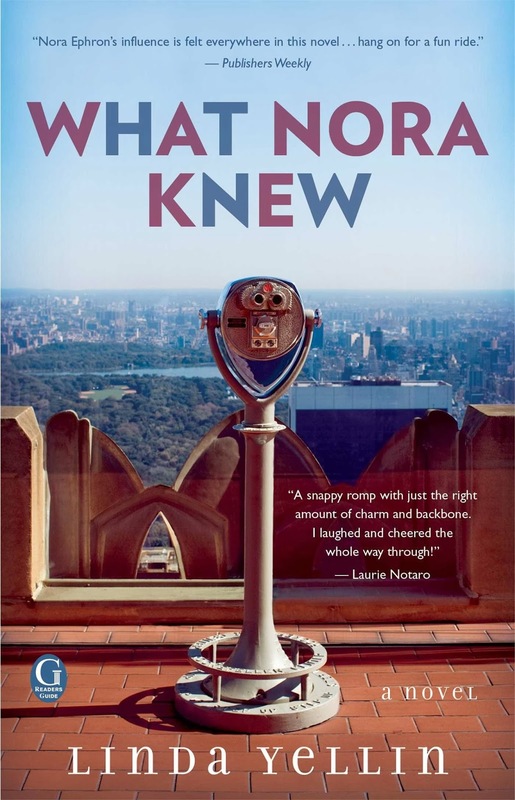 Well, this novel has recently met its match, as Linda Yellin was able to channel the feelings I got from it and put them in What Nora Knew, her homage to the late and great Nora Ephron. Molly Hallberg wouldn't know romance if it slapped her in the face. After a painful divorce, she has opted for a safe relationship. She's more concerned about getting a column in the magazine she writes for than about tying the knot with her current boyfriend, who is more interested in watching Nicolas Cage action films than Meg Ryan romance flicks. When she's asked to write an article about New York City romance in the style of Nora Ephron, she takes on the challenge in hopes of finally getting the column she so deserves (especially after all the crazy stunts she has gone through for the sake of writing articles). However, she's so cynical that she ends up flunking out...big time! What Molly doesn't know is that the opportunity for romance is right in front of her face, but will she be up for that challenge too? I happen to be a huge fan of The Mindy Project and one of the things that appealed to me right away from this show is that Mindy Lahiri is a fan of Nora Ephron movies. She talks about them all the time and some of the concepts have been incorporated into the show. I'm sure Mindy Kaling is a fan in real life, which is why Nora is referenced so much. Being a Nora Ephron fan myself, this definitely drew me in to the show (aside from the many other things I love about it, including the gorgeous Chris Messina in one of the lead roles). So when I found out that a book had been written to pay tribute to Nora Ephron, I was immediately on board! The only thing that didn't work quite as well for me was the abundance of short sentences, even within inner monologues. It was used a lot to portray the minutiae that happened between big scenes, but it also made the dialogue sound scripted. However, since I was envisioning this story on the big screen the entire time, it helped in that regard. Having said that, I really hope this story makes it to the big screen. I already have my casting choices and I hope Linda will agree with (at least some of) them. All I know is that Nora would be proud of this story that so prominently features her first name....and that I have to watch Sleepless in Seattle again. It even inspired me to write a short story. Thanks to Simon and Schuster for the book in exchange for an honest review.